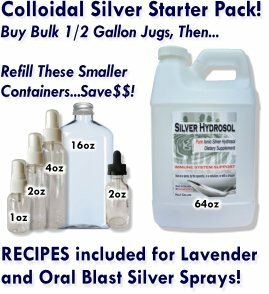 My wife and I use colloidal silver each day. We run a music studio and are in contact with 200 people a week, nearly all of them, these past few weeks, carrying some type of virus. My wife is on the same piano keys her sick students are on. Neither of us have come down with the flu that has afflicted so many here in Southern California this year. We have boosted our immune systems with colloidal silver. We cannot thank CSHStore.com enough. THANK YOU!!! Great story about using our Colloidal Silver Hydrosol to avoid the flu, thanks! Thanks for sharing your story about how our Colloidal Silver has helped you avoid the flu! Recently, I was reading a message board and one thread was about the flu and norovirus that is going around. So many people we catching it, and all the people on the thread either had gotten the flu shot or we rushing to try to find one. Not a single one of them mentioned any kind of natural supplement like Colloidal Silver or Vitamin C whatsoever. All we stuck believing that the flu shot and antibiotics were the way to go yet all of them were miserable and home sick from work. In addition to taking our product as a supplement, I also take Vitamin C, especially if I do suspect a virus is festering. I simply start using the Colloidal Silver and Vitamin C hourly and haven’t had strep, the flu or a cold for several years. Thanks again for your customer friendship and we appreciate hearing your success story!